'Tis the season for pumpkin! Partake with these muffins, which are gluten-free, grain-free, dairy-free and delicious (I promise). 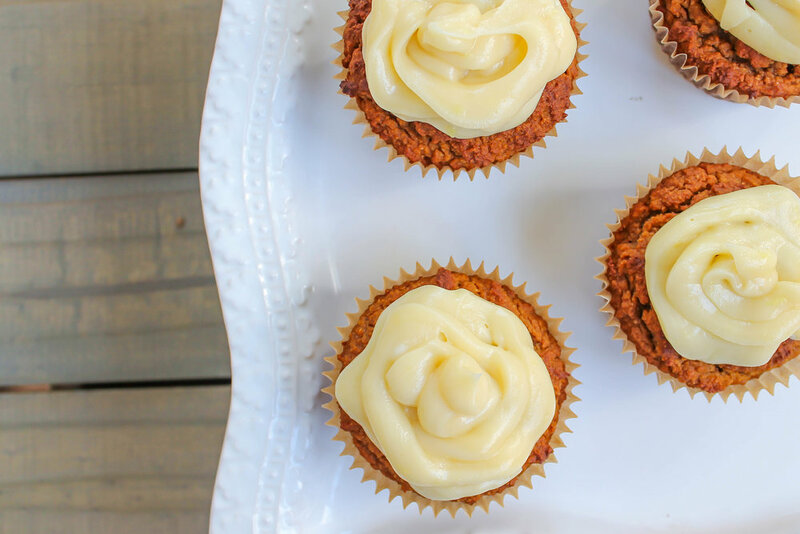 The frosting is made with just five ingredients and paleo-friendly as well. Preheat oven to 375 degrees. Place liners in a large muffin tin (or use regular size*). In a large bowl, sift together almond flour, coconut flour, cinnamon, pumpkin pie spice, ginger, baking soda, baking powder and sea salt. In a separate bowl, add eggs, coconut oil, pumpkin, coconut nectar, and vanilla. Whisk to combine. Add wet ingredients into bowl with dry and beat until batter is formed. Place batter in muffin tin and bake 28-30 minutes, or until tops are golden brown and toothpick comes out clean. *for regular muffins, bake time will vary.